Backyard sheds may be a storage boon, but nobody ever said they were loaded with style. They can be, though. Check out these amazing shed makeovers that will inspire you to give your shed the star treatment. This baby blue backyard shed had seen better days. Though completely functional, it was a curb appeal nightmare. The beat up paint job and the fact that the outbuilding seemed to just float in space was not doing this yard any favors. With a modern paint job in dark charcoal, this shed now serves as the anchor for a patio. The side of it even creates a “wall” for this outdoor room, complete with decor. It’s an oasis for this family, and the envy of everyone on the street. On the face of it, this shed looks like a tetanus shot waiting to happen. Some homeowners might have wondered if the tiny building should just be scrapped. But what an amazing difference a coat of paint can make! And it required nothing more than what was already on hand at the house. A $12 hinge and handle kit finishes off the doors. That may be the best return on investment anyone’s ever made! Many pre-fab sheds look like they just fell out of the sky and into a yard, with no thought about integrating them into the landscape. 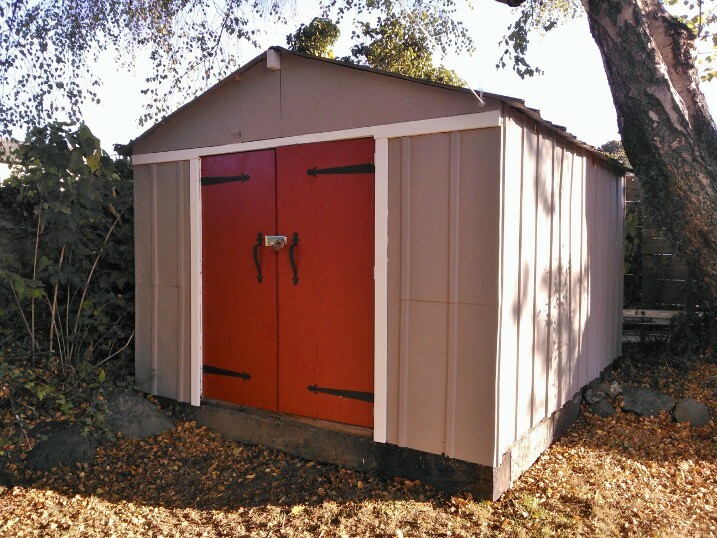 This pre-fab shed gets the star treatment, with a paint job, the installation of shutters, and a ramp for wheeling in lawn mowers or wheelbarrows. Surrounded by simply landscaped beds and a small patio, it becomes an attractive focal point. This barn-style shed served a stint as a backyard tiki hut. But with weeds encroaching and ants setting up house inside, its party days were over. It's unbelievable how $40 worth of paint, trim, and decorative accents could transform this space. The awning adds a a finishing touch at no cost—it's simply a repurposed yard tarp, attached to a wooden frame. Flanked by some fresh plantings, this brilliant makeover gets 5 stars. Never mind about the exterior. The interior of a pre-fab shed is no stunner. If you want to use it for a workspace or art studio, rather than a garden tool storage space, you’ll need to soup it up inside. That’s exactly what happened to the inside of this shed, now a bona fide art studio. After adding a window, running some electric, and insulating it, the owners finished it off with drywall and trim. Paint and shelving were the final touches that made this the perfect work retreat for a full-time artist.